Today, Swedish heavy metal heroes SABATON reveal the title and artwork for their new studio album that will be released in summer 2019. This ninth full length record, that will see the light of day right in time for the band’s 20th anniversary, will be a concept album named The Great War covering stories from the First World War. The Great War will be available worldwide through Nuclear Blast Records on July 19th and pre-orders start on April 19th, so watch out for limited and exclusive editions at www.nuclearblast.com. The band has started the recordings exactly 100 years after the end of the First World War (11/11/1918) and took 3 months of intensive work to complete the album together with their long-term producer and partner Jonas Kjellgren at Black Lounge Studios. Furthermore, the album has been mastered by Maor Appelbaum and the artwork was once again created by Peter Sallai.
. 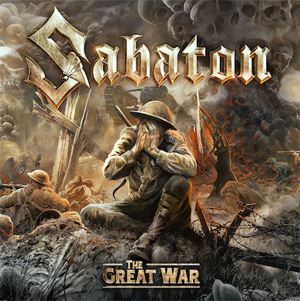 In addition, SABATON posted this trailer revealing more details about the amazing artwork - watch it below.